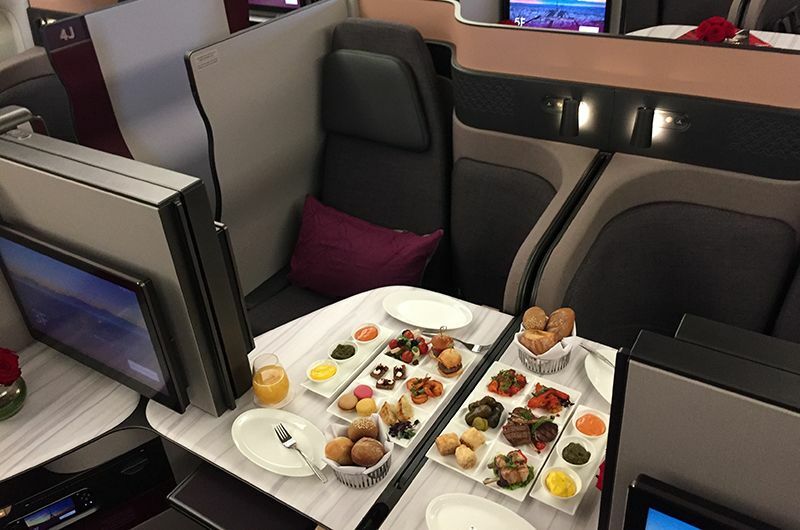 DOHA - Qatar Airways doesn’t appear modest at all when praising its new premium product as “the best Business Class in the world” or, literally, “First in Business”. Anyone who puts the benchmark this high should make sure to be able to deliver. And I make an exception here and put my verdict already at the beginning of a product review: Yes, I am convinced that Qatar Airways succeeds in offering what currently must be the world’s best Business Class. Even the most recent upgrades in Singapore Airlines’ new A380 Business Class don’t really play in the same league, and even less so Delta Air Lines, now offering sliding doors in their A350’s Delta One product. 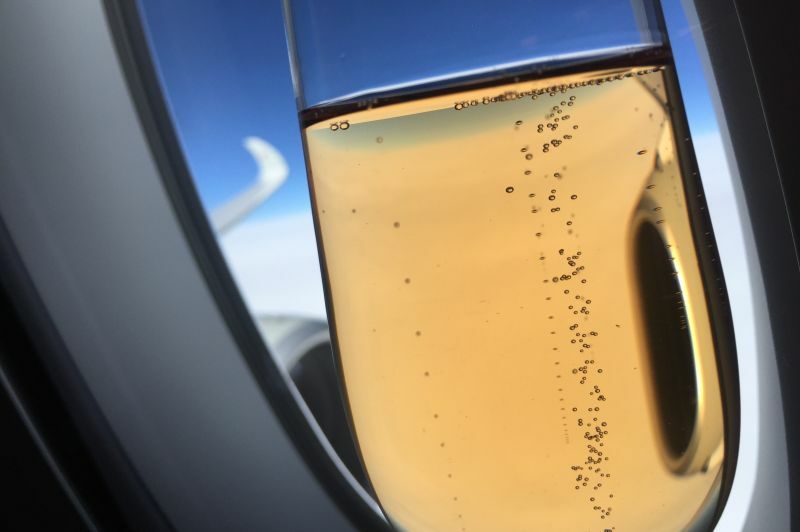 At the end of February there were just 15 retrofitted Boeing 777-300ERs flying the new QSuite, which was first shown in March 2017 at the ITB travel fair in Berlin and first on an aircraft during the Paris Air Show in June. 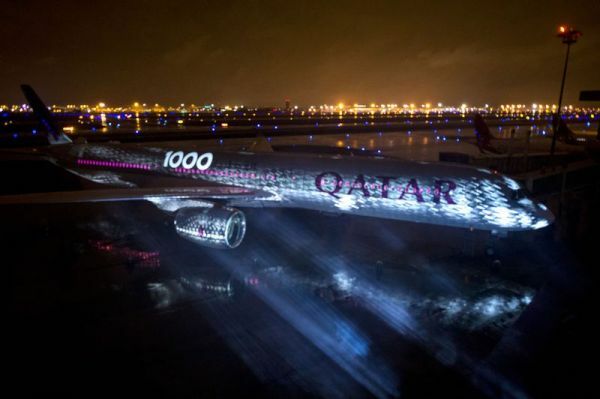 It was also in February that the first two A350s containing QSuites were delivered to Qatar Airways, among them the world’s first A350-1000. 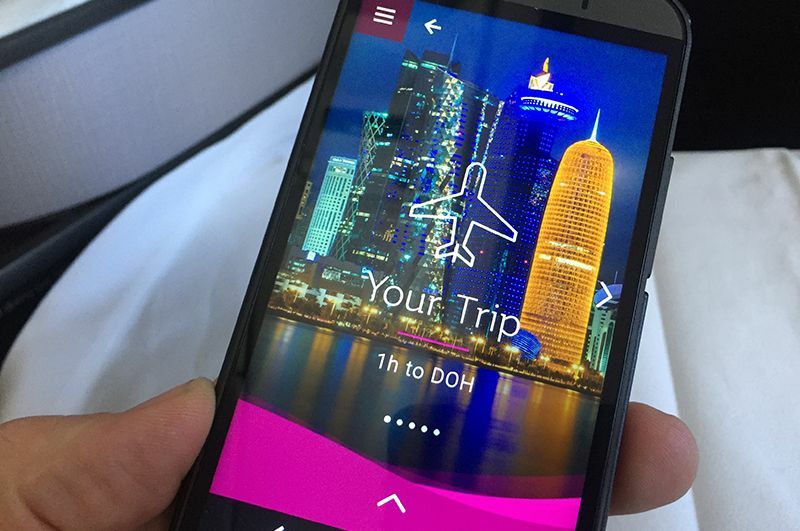 On European routes there are currently only scheduled flights with the new product from Doha to London and Paris. As well as to New York-JFK and Washington-Dulles in the US, followed by Chicago in April. The QSuite will be flying to Frankfurt beginning in May, Munich flights should have it by fall. How different QSuite is already shows during the attempt to pick a seat online. My night flight from Doha to Paris-CDG is almost full, according to the seat map there is only one seat left as part of the new quad seating in the middle. This exactly is the big novelty, that one can travel together as two or four people. I’d prefer a window seat, but that’s supposedly no longer available. But the system rejects to allocate me the free seat within the quad. “Booking should have a minimum of two passengers in order to select QSuite quad seats”, a pop-up message tells me. Which is nonsense, as of course single travellers can sit here, with all the dividers extended. I bring this to the attention of Qatar Airways CEO Akbar Al Baker, who replies this has to and will be rectified. In the end I indeed get a window seat at the airport, although normally 11B wouldn’t be a window seat. But here I have even three windows for myself. Due to the staggered layout of the QSuite cabin all A- and B- as well as J- and K-seats are window seats, comprising the aisle seats as well. This results in a 1-2-1 layout per row. Only to find out about this beforehand is pretty difficult, as there are no seat maps existing yet. Here are the most important facts about the QSuite cabin in the Boeing 777-300ERs: Of the 42 suites, 20 are forward-facing (rows 2,4 and 6 as well as 8DG, 9BJ, 10DG and 11BJ). 22 suites are facing to the rear: Rows 1, 3 and 5 as well as 7EF, 8AK, 9EF, 10AK and 11EF. Six rows (1, 3, 5, 7, 9 and 11) offer two adjacent center seats (all rear-facing), which can be converted into real double beds, by lowering the dividers and even putting filling in the gap. A total of five of these middle clusters can also be booked as quads, each for four people traveling together. I arrive in Doha late in the evening after an almost ten-hour day flight from Cape Town, which took nearly an extra hour due to the detour it was forced to take caused by the embargo of the neighboring states. There is no time to go to the lounge, as in Doha all transfer passengers have to go through a much-criticized security check, while the so called “fast lane” for premium passengers doesn’t live up to its name. I proceed directly to the Paris gate, where I can board at once. Entering the aircraft becomes a special experience at Qatar Airways thanks to the LED mood-lighting system, with the cabin lying mostly in darkness, very effectively bathed in subdued purple light as well as spotlights in the individual suites. The feeling is rather that of entering an exclusive nightclub than an aircraft cabin. 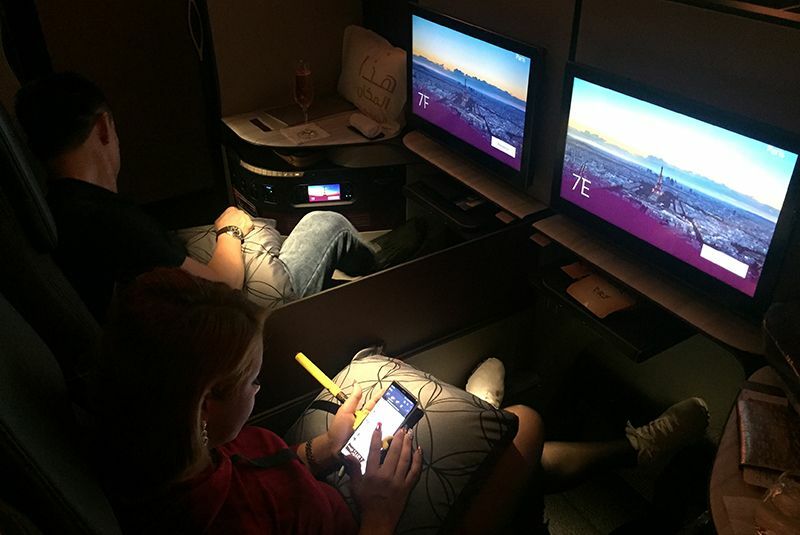 It took three years for Qatar Airways and design agency Priestman Goode to develop QSuite and for Rockwell Collins (formerly B/E Aerospace) to build it. Every passenger gets his/her very own space, which can be closed off by a burgundy sliding door that’s operated by hand needing only a minimal push. Nobody will disturb anyone inside, even more so when the “DND (Do not Disturb)” button on the console is activated. Beneath the seat there is a corner backrest upholstered with fabric, which enables diagonal seating, for which the smaller of the two pillows is intended, having written “This is my happy place” in English and Arabic all over it. On the spacious, permanent marble-look-alike side table, there is a luxury blanket in signature burgundy as well as a high-quality amenity kit made by Bric’s. Even though not all details are even visible to the eye now with low lights, the suite with its superior materials makes a top-notch impression. Beneath the seat there is a kind of console, which can be brought up to also serve as an armrest, or lowered, to widen the bed space. Its lid upholstered in leather imitation can be opened, to reveal a spacious stowage box for gadgets or glasses, also it is here that one finds a water bottle, headphones and the inflight magazine. Very well thought out and also somehow nifty. On the edge of the “marble” table there are all the buttons for the seat functions. But there is a big disadvantage especially at night: All are only lit in white, which makes them very difficult to distinguish, even more so for people with impaired vision who have put off their glasses to sleep. In comparison, it’s easy to handle the 21.5’’ touch screen in brilliant resolution, either on the screen or via the console stowed in the armrest. I instantly feel at home in my suite, request a glass of rosé champagne (Billecart Salmon Brut) – as Qatar Airways is the only airline offering its premium customers a choice of rosé and white French champagne even before takeoff. I am however severely tired around 1am local time and put off by the information that the flight to Paris will not even last six and a half hours. So I have to maximize the precious bed time. I brush my teeth even before takeoff and don the very comfy pajama of The White Company. I reject any offering from the menu (soup, salad, sandwich, chicken breast with rice, chocolate dessert) and extend my bed immediately after rotation, while below us the Doha skyline is blinking. The bed length is two meters (79’’), seat width 55cm (21.5’’). These dimensions are not setting records, but the space is really generous, partly also due to the lowering of the armrest console. Shortly after rotation the flight attendant appears and releases the blocked sliding door with a screwdriver. I slide it shut, put on the “DND” sign, cover myself with the comfy, but not too warm blanket and fall into deep sleep. That rarely happens to me in-flight, no matter how tired I am. The coziness of the suite, the toned-down light and hardly any casual noise in the well-separated compartments are enhancing sleep. Of course I also let go of any breakfast offering at an ungodly hour, instead I sleep until about 15 minutes before landing. Only then I discover at the neighboring seats that I had missed last night to have my bed properly prepared, including a kind of upholstered cover, maybe my experience would have even been more heavenly with it. Luckily the flight attendant gets me a cup of hot tea only minutes from touchdown. I sincerely regret that this night is over already when I see icy Paris winter fog wafting in front of my window. I have the good fortune of getting a second chance, this time to try out the QSuite by day. Only two days later Qatar Airways receives its first A350 equipped with the new product, which is also the world’s first A350-1000. There were lots of delays in integrating the suites into the A350 for the first time, so the delivery comes two months late. On a delivery flight with lots of media hubbub many things can’t be compared to a scheduled flight. Instead, CEO Akbar Al Baker is on board, who demonstrates some functions of the suite to me personally, as he was instrumental in its development. Only now it occurs to me how stubborn the foldout table can be when one tries to extend it, as there is no button anywhere to be seen for that. Turns out you have to put your fingers into a recess underneath the un-deployed table, which is hard to sensually locate, push it and then the table comes out. At least the desk top is nice and firm, very well suited to work on a laptop. Al Baker is visibly upset that Wifi, announced by him as “fastest internet in the sky”, only works grindingly slow. “We pay for this,” he snaps and calls for engineers to report to him. They explain that the satellite frequencies in question are only available from March, while this flight took place in February. The offering, however, is only made on the A350 fleet, while the much bigger Boeing 777 fleet so far has no Wifi whatsoever. Which is a major criticism even from users who are otherwise taken by QSuites. I am sitting on board the A350-1000, offering 38 suites in the front and eight in the second cabin, initially in the center on a seat facing forward. Then I can switch to a window seat with a view backwards of the wing and engine. Also by day the suites offer an extremely enjoyable environment. Even on a special flight with lots of goings-on, the closing of the sliding door provides a surprising level of tranquility. Qatar Airways, contrary to other airlines, invests a lot of effort in such flights, even produces special menu cards and also customized amenity kits for this occasion. Even inflight service is supposed to pull out all the stops, which is often difficult on such missions. 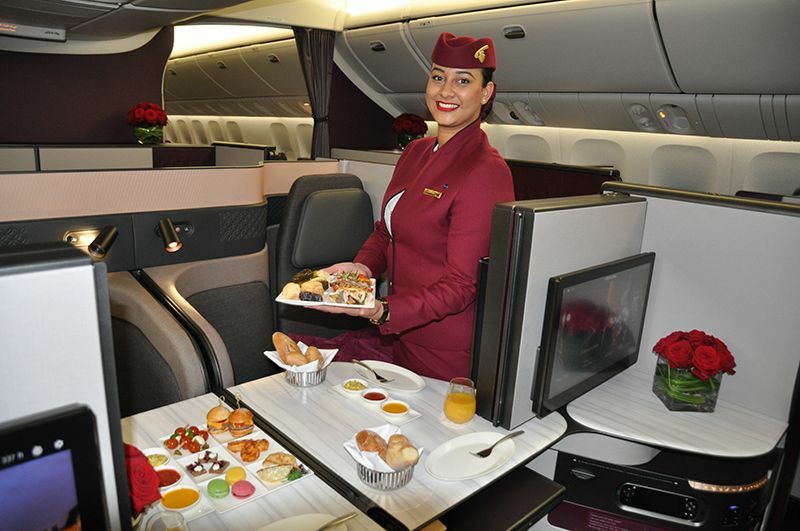 They even offer the hallmark of QSuite service, the snack platter (six small items including one mini brownie) intended to be shared in the quad seats, of which also single travellers can get a smaller version. As premium customers always get what they want on Qatar Airways, and at the time they want it. OK, maybe not so much on this flight, the crew needs seemingly endless to deliver something ordered long ago. This makes me realize how difficult it is to find the crew call button. It is located in three different places, but not where one would look. Instead, in a miniature version, underneath the screen, also as a small button beneath the reading lamp, behind the passenger, and finally also in digital version in the IFE console. This is where I make a surprising discovery: On the backside of the console is a camera eye, similar to any smartphone. Why, that remains a mystery for the time being. A big plus in any case: Every suite has two fresh-air vents that actually provide a refreshing effect. Shortly before landing in Doha after almost six hours of flight, I finally get served outstanding Lobster Mararoni Cheese, adding to my wellbeing as much as the cabin altitude of only 6,000ft (about 1,800m) on board the A350. A well received distinction to the Boeing 777, whose cabin altitude is about 8,000ft (ca. 2,400m). 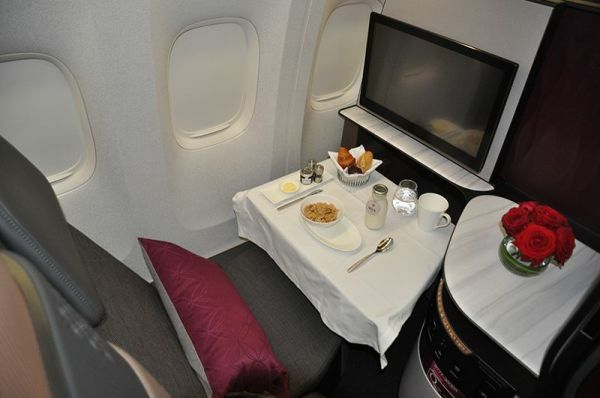 The Qatar Airways QSuite sets a new level for Business Class, fulfilling the promise “First in Business” in many aspects. Nowhere else it is possible in Business Class to have a choice of either almost total privacy or traveling together with four persons, or instead share a proper double bed deserving its name with another person. 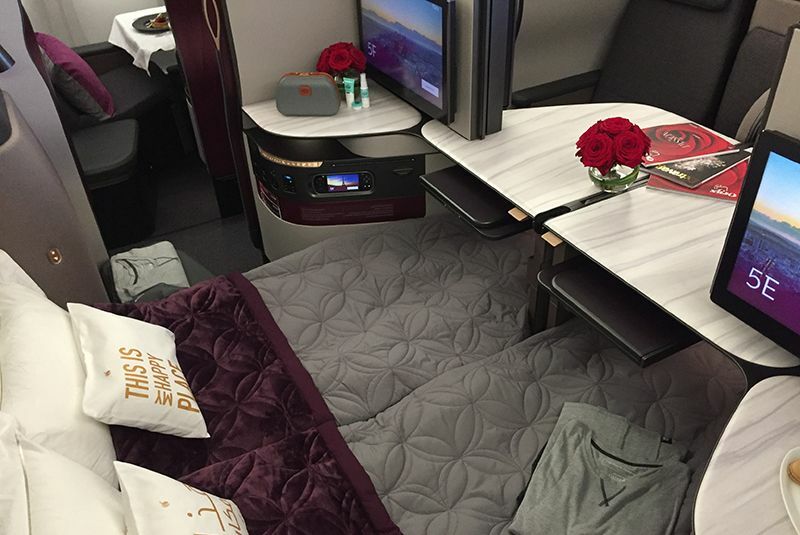 In service and quality of the overall product, Qatar Airways is second to none in any case. Only big drawback is that for the time being none of the Boeing 777s will offer Wifi.